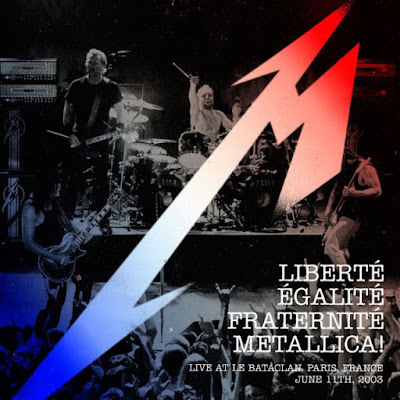 MetalRockNews: Metallica reveal cover artwork for "Liberté, Egalité, Fraternité, Metallica!" Metallica reveal cover artwork for "Liberté, Egalité, Fraternité, Metallica!" Metallica revealed the cover artwork for "Liberté, Egalité, Fraternité, Metallica! - Live At Le Bataclan. Paris, France - June 11th, 2003" which will be released on April 16 for this year's Record Store Day. You can see the artwork below.